Brickell is an urban area of Miami located south of the Miami River extending south to the Rickenbacker Causeway. Brickell is South Florida’s primary financial district. A commercial boom in the 1980s resulted in mass construction of office towers in Brickell. Today the area has become one of the largest financial districts in the United States. Miami “The Magic City” is always changing and evolving. Upcoming projects for several buildings along Brickell will be adding to the city’s skyline. The west area of Brickell is primarily a residential neighborhood and west of the Miami Metrorail line (SW 1st Avenue). To the north of Brickell is Downtown, home to the Miami Main Library, parks, museums, sporting venues and most of the area’s public elementary schools. The south area of Brickell is mostly low to mid-rise residential buildings and single family homes from the early 1900s along South Miami Avenue. Brickell Avenue includes “Millionaires’ Row”, home to expensive residences, as well as iconic Miami skyscrapers. Brickell was originally platted for mansions and large homes by Mary Brickell, which led to the name “Millionaire’s Row”. Mary Brickell and her husband William Brickell worked alongside Julia Tuttle and Henry Flagler to establish Miami during the late nineteenth and early twentieth century. Mary Brickell wanted to develop a boulevard with wide roads and landscaped parkways. She was not only a business woman, but also known for her generosity. She would provide people who were unable to get loans at the bank with interest and collateral-free loans. Today, many roads, a village and other things are named after her. Mary Brickell Village is located at the center of Brickell. As a popular downtown destination especially for the night crowd, The Shops at Mary Brickell Village offer entertainment, dining, specialty retailers and high-class fashion shops. Residents and visitors can enjoy the parks at Brickell. Simpson Park Hammock is a 7.8 acre nature preserve park located on South Miami Avenue and Broadway. Originally known as Jungle Park, in 1927 the park’s name was changed to honor Miami botanist and conservationist Charles Torrey Simpson. Alice Wainwright Park is another nature preserve park located on Brickell Avenue and the Rickenbacker Causeway. Miami Circle, Brickell Key Park and Southside Park are also located in the Brickell area for everyone to enjoy. Brickell Key is an artificial triangular island at the mouth of the Miami River. Brickell Key is occasionally referred to as “Claughton Island”, in honor of Edward Claughton who purchased the land that forms Brickell Key today. Brickell Key real estate can be traced to 1896, when Henry Flagler had a 9-foot deep channel dug from the mouth of the Miami River. In the process, Mr. Flagler created an off-shore property composed of two small islands. 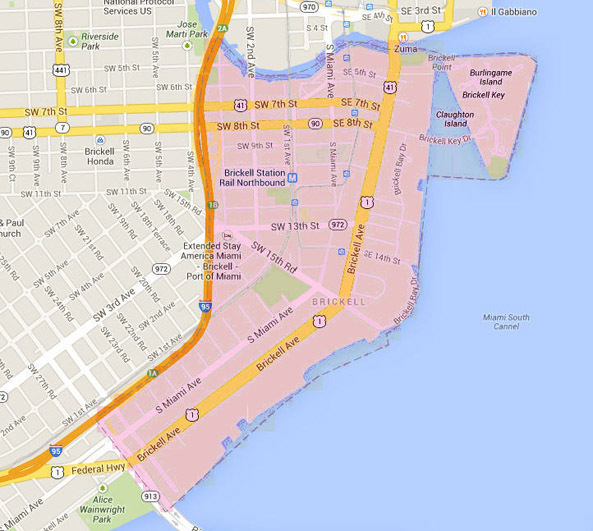 In 1943, a real estate investor, Edward N. Claughton, Sr. acquired the Brickell Key islands. In the late 1970s, Swire Properties, a company based in London and Hong Kong, purchased most of the Brickell Key island real estate property from Claughton, and began to put into place a master plan, including a bridge which would connect to the island, that would ultimately transform it into one of the most distinctive island communities in the world. Brickell Key Condominiums include One Tequesta Point, Two Tequesta Point, Three Tequesta Point, Asia Condo, Isola, Carbonell Condo, Courvoisier Courts, Brickell Key I and II , and St. Louis Condos near the Mandarin Oriental Hotel. The island is enjoyed by both guests and residences. A shuttle bus service circulates between the Brickell Metrorail/Metromover station and Brickell Key, with stops along Coral Way, SW 2nd Avenue, SW 8th and 10th streets, Brickell Avenue, and Brickell Bay Drive. This small island is separated by few feet of water from Miami’s very developed Financial District in the heart of Downtown Miami, thus making it a very desirable place to live for business men and entrepreneurs who want to avoid rush hour commutes.